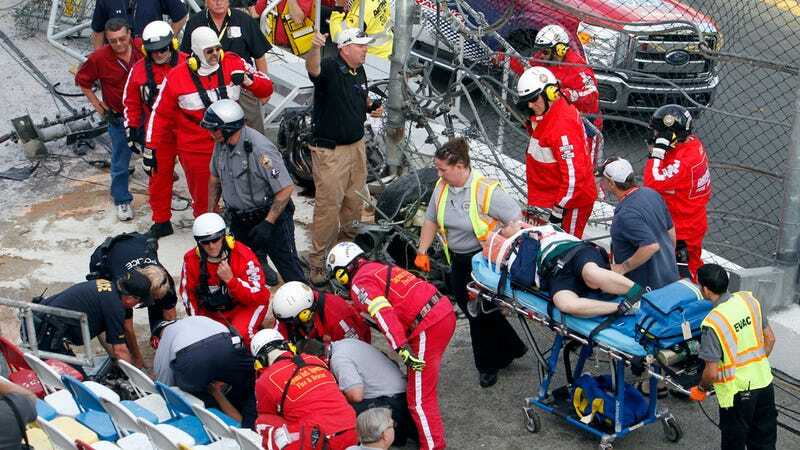 As the 30-odd fans injured in Saturday's NASCAR crash at Daytona continue to recover from their injuries, lawsuits are more than likely on the horizon for the track and the sport's governing body. The Associated Press reports that a lawyer for three of the injured fans is currently exploring the possibility of a lawsuit, although he said he would prefer to settle instead. Any litigation would probably focus on the fence between the track and the grandstands through which parts of Kyle Larson's car sailed on Saturday, injuring dozens of people. All of the injured fans have now been released from the hospital. The AP spoke to several legal scholars who seemed to disagree whether NASCAR or the Daytona International Speedway could be held liable for what happened. Litigation could also focus on the manufacturer of the fence. One personal injury lawyer said NASCAR will most likely settle the case. What do you guys think? Should NASCAR or the track be held liable, or did the fans assume a risk when they came to the race?